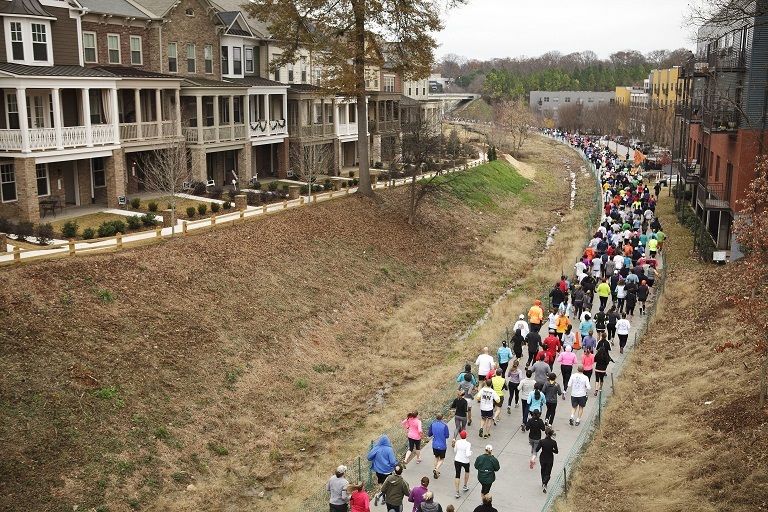 Today's cool idea in urban development is the Atlanta Beltline. 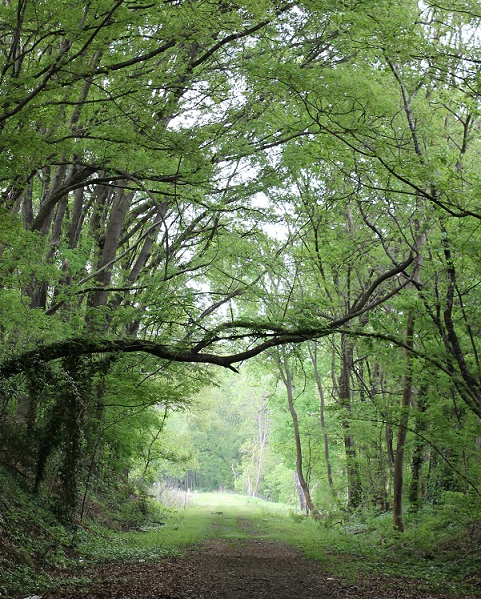 The idea first occurred to Ryan Gravel in 1999 when he was a master's student at Georgia Tech: turn 22 miles of partially abandoned rail lines that encircle Atlanta into a corridor for light rail and pedestrian/bicycle trails. This is well inside the I-285 Beltway, running through much more urban areas. When Gravel got a job in an architecture firm he mentioned his idea to some of his colleagues, who loved it. They developed a prospectus for the plan and sent it to a few dozen influential people around Atlanta. Some of them also loved it, including the head of the city council's transportation committee. By 2004 a movement was under way. An undeveloped piece of the old rain line. The Beltline will connect several existing parks, and the plan calls for creating more than 1000 acres of new park land, both by expanding existing parks and establishing new ones. The Beltline started as a transportation plan, focused on street cars. But if that ever happens it will be the last piece of the plan to take root. So far it is the walking and biking trail that has been developed, and the completed sections are very popular. Trails, after all, are a lot cheaper than streetcar lines, and don't usually attract much opposition. 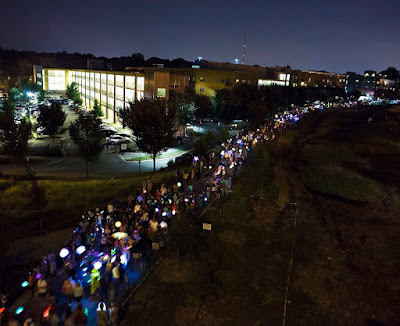 Above, lantern parade along the Eastside Trail, the first section to open, in 2012. There are also Beltline Fun Runs and Beltline Art, a series of exhibits showcasing local artists. But just the partial trail has already had big impacts in Atlanta. Hundreds of new apartments have been built along the Beltline, and property values are rising along the Eastside Trail. The streetcar network has been written into greater Atlanta's 2030 transportation plan, and environmental impact studies are under way. But as yet there is no money to build it. The people behind the Beltline have big goals: a more transit-friendly and walkable city, residential redevelopment of old industrial districts, rejuvenation of rundown neighborhoods, more parks, more affordable housing. It remains to be seen whether it will meet them. But it has already gotten a lot of people around Atlanta excited about making their city a better place, and that in itself is worth a lot. Good summary article here. The Beltline web site here. Ryan Gavel's TEDx Talk here.